Jack has been a resident of Las Vegas for over 35 years. He personally designed and constructed his home which includes many upgrades. Now others will be able to enjoy his vision of country living with extreme privacy. and...oh so close to the strip! You can't get much closer to the Las Vegas Strip unless you want to be in a casino. This is also my home, not just a rental. Rural setting of custom homes within walking distance to the strip. pool table, 6 stool bar, refrigerator, big screen TV and couches. The master bath is finished with granite counters and hand laid tiles. A euro style walk-in shower is handcrafted, completely covered from the floor to the ceiling with petite size tiles. Shower area is quite large multiple shower heads. Put on your robe and sink into your king size bed. Don't forget to turn on the double sided fireplace before settling in! Very cozy! All who enter this suite say...'WOW!' There are 3 other over sized bedrooms with Queen sized beds to escape to. The game room consists of a full sized pool table, big screen TV & stereo. Full size Neptune washer and dryer are located in laundry area. Plenty of parking is available: motor home(s) ski boats... Property is located off main street. Parking for RV/Boat/Trailer, special events, weddings. Our weeks experiences fell short of our expectations! Property owner, his son & daughter in law did attempt to resolve most issues. Unfortunately, these problems should have been resolved before the property was re-rented. I'll start with the inside of the house. *(RO) Reverse Osmosis did not work. His son told me he didn't drink the faucet water. If we wanted to drink water best to use the refrigerator dispenser. We decided to be safe & purchased cases of water for the week. (Property owner said later he drank the water). *The game room refrigerator was basically turned off. His son came over to find the temp was turned off. He turned the temps up, 8 hrs later the fridge was usable. *First person taking a shower realized the water didn't drain. His son removed a braid of greasy hair the size of a beaver pelt. I suspect this tub was cleaned with paper towels and spray cleaner. If tub was cleaned properly, they would've known. *Major ANT infestation day 1 & day 6, all over kitchen counter. Exterminator called & sprayed haphazardly, puddling of pesticide every where. Pesticide even sprayed over children's carseats & clothing neatly stacked on the floor in their rooms. *The large TV in the game room didn't work. His son came over & was not able to get it on. *Thermostats didn't maintain even temp. Property owner & his son did attempt to fix the problem more then once, but temps in (2) of the bedrooms were very warm during sleeping hrs. The thermostats would default to 80-85 degrees multiple times day/night. *7 burnt bulbs master bath vanity & table lamp light bulb socket very loose. *Out door toilet & room absolutely filthy. Had to clean toilet tank, seat, & lid before any of my family could use it. *Pepsi beverage cooler & glass top table was black with filth, had to clean myself. *Old beer cans & large pile of dog excrement on gravel next to patio dining area. *Fire pit next to pool didn't work. No fire ring per his son. Advertised as working. *First observation of back yard. The dining & lounge chairs were in disarray. Some cushions on, some half off, & others piled in the corner of the patio. *5 of 10 people caught Dermatitis, per our Dr, likely pool chemical related. Prepare to have $500 cash as part of the security deposit on arrival. I missed that point in the contract. "Reviewer left extremely exagerated account". They were wanting to get a $1000.00 refund for not posting a bad review. We are more than happy to address every issue. Better than home. Fab Villa, Fab location. Great for a group. One of our best holidays ever! Gorgeous Villa with all amenities. Fab hosts Jack & family, really made us feel welcome and relaxed in their accommodation. We were a family of 4 plus 5 friends and we had an amazing holiday here. Used Uber and Lyft to get to the strip just 5 mins away. The villa is a great size and has plenty of room for everyone to enjoy. The pool and outdoor area with BBQ as well as the games room/bar area were great places for us all to socialize together. This was our first visit to Las Vegas and Wow we loved every minute. Hired a Mustang, went to Hoover Dam and Redrock, some did helicopter trips, gun range etc. So much to see and do. We managed to visit most of the hotels along the strip and see the sights. Hopefully we can go back and would definitely stay at Jack's place again. The Villa has everything you need and more. 'Wow' was our impression as we walked in. Jack and his family were so lovely and helpful. Highly recommend, suitable for families and groups of friends. Thank you so much Jack and family it was amazing, we had a brilliant time. Helen, Tony, Ash, Danielle,Reece, Chris,Matty,Dean,James .Lots of great memories , holiday of a lifetime! Every year my company rents a house off the Las Vegas Strip for the staff to stay while we are in town all week for the annual trade show. This is the second year in a row we have snagged this one and it is by far the best rental we've stayed at in Las Vegas!! Not to mention cheaper and more luxurious than the comparable options. After a long day working at the trade show, it's great to come back to a quiet area with tons of space for everyone to spread out. The kitchen has everything you need for meals and we always love using the pool table, chess set, and multiple large TV's in our off-time. House is clean with great amenities. Beds are comfy. It's also very conveniently located for our needs with a UHaul, FedEx, UPS, and tons of yummy restaurants (with our current favorites being Miko's Sushi, Bachi Burger, Cafe Berlin, & Texas de Brazil!) within a few minutes drive. Thank you, Jack & Carolyn!! We will be looking you guys up when it comes time to book for next year! Perfect home for our party!! We celebrated my mom's 90th birthday and had over 60 people attend from all over. Being so close to the airport made it even better for everyone who traveled by plane. The house was perfect for our party!! LOVED IT!! It was very spacious and had everything we needed. The owners were very nice and helpful. Anything we needed, they were there. Everyone loved the house and we had the best birthday party ever!! A special thanks to Carolyn for always being there and helping whenever we needed something. We will be back!! Enjoy world class shopping, entertainment, nightlife and restaurants. This home is also available for private events. Fun and sun on Lake Mead can also be arranged. and One of the Seven Wonders of the Industrial World-- Hoover Dam is just a short drive. Step outside to a fully landscaped yard. 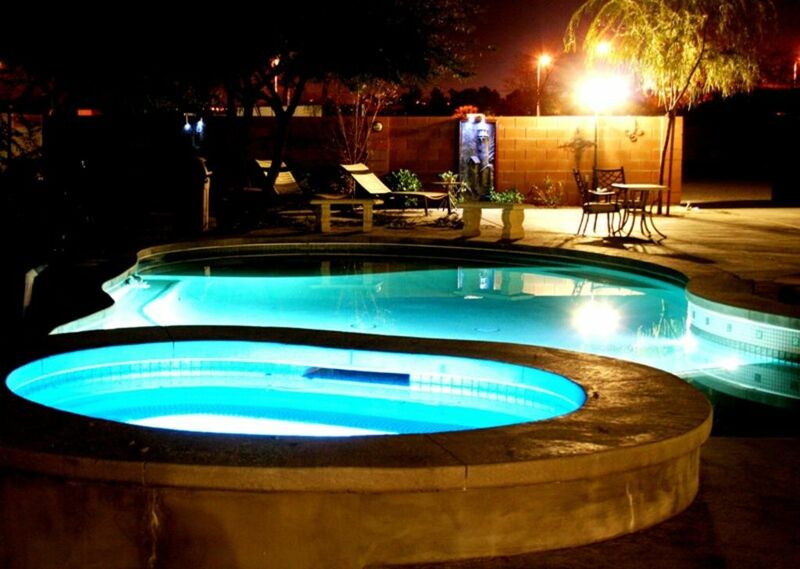 Home includes pool & spa, full grass area, wedding/event arbor, fire ring with sitting area bbq's & heat lamps. Grounds to walk through or sit in with a park like setting to enjoy. Transportation, Maid Service, Watercraft excursions, Escorts, available on request. Golf: too many to list. Function fees and cash deposit to be quoted separately. Undisclosed pets are grounds for immediate eviction.